Charge up the Case Air prior to using. You’ll want to check the battery levels on your camera and the device you are connecting to. Same as with tethering with a cable – make sure that all three components are fully charged before beginning – the Case Air, your camera and the device you are connecting to (phone, tablet or computer). Keep the camera turned off and connect the Case Air to the camera with the supplied USB cable into the USB data port. Turn on the Case Air – press and hold the button on the top of the Case Air. The blue light will flicker, then turn to a solid blue light. Once solid, the WiFi network has been created. On the device (phone or tablet or computer), connect to the Case Remote WiFi, enter the password located on the bottom of the Case Air itself. Open the app or software, you’ll see a message there’s no camera – Now turn on the camera and allow the camera to communicate to the app via the WiFi network, refresh if needed. We recommend shooting in RAW+JPG small. The RAW files will save to the card in the camera. The JPG thumbnail will transfer to the device for review. The Case Air is fully charged, you will get a green light. Charge up the device you are connecting to – iOS or Android. Disable Personal Hotspot and Bluetooth – you may need to put the device into Airplane Mode. Remove WiFi cards from the camera and disable any WiFi communication on the camera. The correct cable is connecting from the Case Air into the USB port on the camera. Close all other apps on device, run Case Remote only. If connecting to Android or Windows device, disable anti-virus apps or software. Update the firware – check Update (in Settings). Be sure your camera has been updated with its latest firmware updates. Empty the cache regularly (in Settings). Lanyard with Threading Tool. Watch our video on how to Connect the lanyard to the Case Air. If you get a notification of a firmware update, please update, make sure the Case Air is fully charged before updating the firmware – DO NOT turn off the Case Air or the device you are connected to during the firmware update, this will cause a malfunction. The Case Air currently only has full functionality with Nikon and Canon cameras. We’re working on expanding the product to be compatible with other camera brands but no timetable as of yet. For a complete list of supported Canon and Nikon cameras, click here. Are you planning on supporting a particular camera model? How do I determine the firmware version of the Case Air application (Case Remote) I have installed? For complete instructions on how to determine which firmware version of Case Remote you have installed, please visit this page. How do I determine the version of the Case Air application (Case Remote) I have installed? For complete instructions on how to determine which version of Case Remote you have installed, please visit this page. How do I update the Case Air application (Case Remote)? Our developers are continuously making improvements, adding features and sometimes fixes to Case Air. When updates are available, please follow the instructions here to update your device. What is the silver metal device included in the box? That is the Lanyard Threading Tool. To better help you install the lanyard, we’ve include this tool to help fish the cord through the Case Air. To learn how, watch this video. How do I install the MacOS Application? Visit the Mac App Store for the Case Remote. Click Install. How do I install the Windows Application? After you’ve downloaded the .zip file, double click it and extract it to your computer. Open the folder it creates and double click on setup. Follow the prompts to complete the installation. Where do I download the app/software? Why Can’t I Shoot Video on the Nikon D850? Unfortunately, the Case Air does not support movie mode on the Nikon D850. What do I do if the blue light on top never goes solid? In order for the Case Air to work properly, the blue led light on top needs to be solid blue. If you are experiencing a situation where the blue light continuously flashes, please contact technical support or fill out the contact us form (the orange button at the bottom of this page). I have a Canon Rebel Canon T6i, T6s, 750d, or 760d. Why won’t the Case Air recognize it? If you are having trouble connecting to this camera, it may be because the built in Wi-Fi is enabled. To disable it, go into your menu, move over to the first wrench icon at the top, touch the Wi-Fi/NFC option and choose disable. Why can’t I see my photos in the Photos app on iOS? Check that the app has permissions to access the iOS photos. Go to Settings -> Case Remote and check to see if it has photos permissions turned on. How come touch to focus is not working on my Canon? Many Canon cameras have a setting for auto focus mode in live view. Please check your camera’s user manual for this specific setting. It is often found under a menu item called “AF Mode” or “Live View/Movie func. set.” Often resetting your camera to factory defaults will set this to the proper setting. I have a Wi-Fi signal, why can’t I connect to the Case Air? Likely your device is not on the Case Air Wi-Fi network, but rather on some other local network. To change network, open the “Settings” app on your device, then select “Wi-Fi” and choose the Case Air network. I’m done using Case Air, why can’t I get the Internet? Your device is most likely still connected to the Case Air Wi-Fi network. To change network, open the “Settings” app on your device, then select “Wi-Fi” and choose the the approriate network. How do I troubleshoot my connection? Check out this page on help troubleshooting your Case Air connection. Does my camera require any changes to settings? If you are experiencing connection issues, check if your camera has a USB Mode and that it is set to P2P mode and not mass storage mode. If it has FTP settings, please turn those off. How do I prevent my clients from accidentally manipulating my camera settings while viewing on a smart phone or a tablet? Client Lock Mode removes all camera controls from the Case Remote app main display so that your camera settings can’t be changed, or the camera controlled. Why is the image in Case Remote appearing in the incorrect orientation? I’m shooting in Portrait Mode, but my images are appearing in Landscape Mode. Be sure to check the camera menu setting for Auto Rotation and set it to On so your images will automatically appear in the correct orientation in Case Remote. Is there a 2 second, 5 second or 10 second timer setting on the Case Air? The Case Air does not have a timer function, but you can use the timer function on your camera and have the Case Air trigger it as if you pushed the shutter button. If the cable falls out of the camera, how long before the Case Air disconnects? This can vary from immediately to up to a few seconds depending on what the Case Air is doing when the cable disconnects. If it disconnects, you should be able to reconnect it, and then hit the refresh button in the title bar. The Case Air should reconnect without issue. Can I view my picture in full screen mode on a phone or tablet? Currently, the largest way to view the image is to double tap on it in on your phone or tablet. We are currently in development of a more advanced full screen mode that should be released by Fall 2018. Can I connect multiple devices to one Case Air at the same time? No. While you can technically connect to the Case Air from multiple devices (laptops, tablets, smartphones), the images you take will not be sent to all connected devices and you cannot set which of the devices it sends to. Can I use a camera speed light flash or studio strobe trigger with the Case Air? Yes. The Case Air does not require the camera’s hot shoe in order to work. 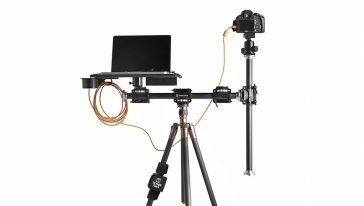 The hot shoe is a convenient place to mount the Case Air when you are not using a speed light or trigger, but in those cases where you need the hot shoe, simply hang the Case Air off the side of the camera using the included lanyard. Which cable do I use for the Nikon D3400 or Nikon D5600? These two cameras from Nikon use a different USB port than other Nikon cameras, the USB Micro-B 5-Pin. This is the same port found on the Case Air product. The Case Air doesn’t ship with a Micro-B 5-Pin to Micro-B 5-Pin cable. You will need to use the USB cable that came with your camera along with the OTG adapter that came with the Case Air. Plug the small end of the cable that came with your camera into your camera and the other square end into the female side of the OTG adapter. Plug the other end of the OTG adapter into the Case Air. Can I use bulb mode and time lapse at the same time? No, currently you can not use both bulb mode and time lapse at the same time. Can I use the Case Air with Adobe Lightroom or Capture One? Yes. Both Adobe Lightroom and Capture One support watched folders. A watched folder is a folder that the program monitors for new images. As soon as it detects a new image, it auto imports that image into that program. To set this up is a two step process. First you need to configure where the Case Remote software saves the images (Instructions: Mac or Windows). The second step is to configure Adobe Lightroom or Capture One to monitor this folder (Instructions: Adobe Lightroom or Capture One). What are the exact focus stacking increments? In the Case Remote application when doing focus stacking, you are presented with the options to increase or decrease focus in steps of 1, 2 and 3. These numbers represent small, medium and large changes in focus. The exact change of focus, depends on the camera and camera manufacturer. These amounts are not published by camera manufacturers and therefore we can not tell you exactly how much focus will change. Our best recommendation is to experiment and find the setting that works best for you and your specific shot. How do I attach my Case Air after connecting it to my camera? The Case Air features an integrated hot shoe mount for using on your camera. If you’re mounting a flash or trigger on the hot shoe simply add a RapidMount Accessory Extension Bar to your hot shoe. Then, you can mount both the Case Air and flash/trigger on the bar. You would plug the Case Air into the USB as normal and then use a sync cord to plug your flash/trigger into your camera’s sync port. To learn more , visit How to Mount the Case Air to Your Camera. If you are shooting RAW only, the Case Remote software will only show a RAW preview image. This RAW preview image is meant to be displayed small, so when it appears on your device or computer, it’s pixelated and not sharp. To view sharp images, shot in JPG or RAW + JPG mode. How fast do JPEGs and RAW images transfer from the camera to your device? In our internal testing, JPEGs transferred in approximately 5 seconds, RAW images were longer due to the size of the file. Can I shoot RAW files? iOS: If you shoot in a mode that includes a RAW file, the Case Air will send the JPG and the RAW thumbnail (not the full RAW file). There will be a thumbnail icon of the RAW file to let you know the RAW files was captured. Android: If you shoot in a mode that includes a RAW file, the RAW file will be sent to your Android device. Since the RAW files need a special software to open, it will not show in the Android photo gallery. You will need to find a folder named “CASE Remote” in your storage, all the files you download are in this folder. 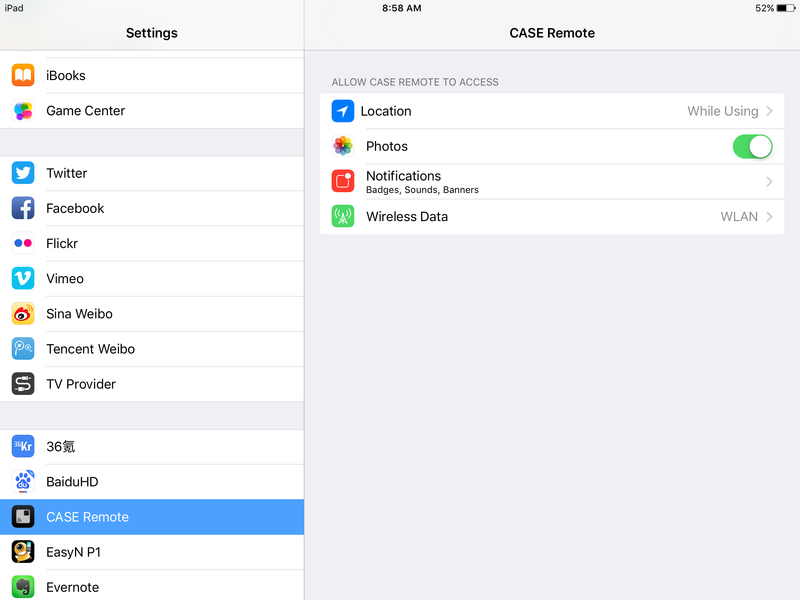 If you can’t find the folder, you can search “CASE Remote” in your local storage. Mac & Windows: If you shoot in a mode that includes a RAW file, the RAW file will be sent to your computer. This will be a configurable option shortly. How come Live View exposure isn’t changing or updating? There are a few things to check all related to the camera. If you are shooting in Aperture Priority, Shutter Priority, or Program mode, exposure won’t change unless you change exposure compensation. When in Manual mode, the exposure should change based off your settings. If you are not seeing this updated in the Case Air or on the back of your camera, the issue is your camera. For Canon cameras, make sure “Exposure Simulation” is on. For some Nikons, there is a setting called “Exposure Preview.” Please refer to your camera manual to determine if your camera has this setting and how to turn it on. Please note that many cameras will not do exposure previews in movie shooting mode. This is a limitation of the camera, not the Case Air. This includes but is not limited to the Nikon D800 and D810. Can a single Case Air work with different cameras? Yes, each Case Air can work with any of the supported cameras. However, each Case Air can only control a single camera at a time. What happens if I delete an image? If you use the delete icon (trash can) to delete a photo from the capture screen or the album screen, it will remove the image from the SD/CF card on your camera. You are deleting it permanently. If you just wish to remove images from the thumbnail viewer, go to settings, click or tap on clear cache and relaunch the application. Can I still write images to the SD/CF Card? Yes. In fact you are required to shoot to camera’s card as well as the Case Air App. Can I use Case Air while it is charging? Yes, you can continue to use the Case Air while it’s charging. This will require a separate cable (sold separate) that allows you to do both. With this cable, you can charge the Case Air via any USB outlet like a wall adapter or external power bank. How do I connect my device to the Case Air? The Case Air is fully charged (green light) and you have fully charged batteries in the camera well. Shut everything down. Turn off your camera and the Case Air. Completely close the app or the software, do not simply not minimize it. Turn on the camera so the app/software will then recognize the camera. If you get a notification of a firmware update, please update, make sure the Case Air is fully charged before updating the firmware. Can I use it to watch while my camera man shoots video? You can use an external device as a monitor when shooting video. This means with a smartphone, tablet or computer you can watch what is being recorded as the video is being shot. Since the video is being sent over a WiFi connection, the video display will lag behind the real-time video. This isn’t normally an issue if the camera is stationary, but if there is a lot of camera movement or panning, the lag may be inconvenient. When recording video with the Case Air, is the audio that the camera records audible on the device or computer? The audio is recorded by the camera and saved with the video. Playback is only possible when you download the video from the Case Air Album – or when connected to a Mac laptop, Photos. Then the downloaded video plays on the laptop, with the audio recorded by the camera. It’s not possible to playback the video while in the Case Remote software. How do I review video that I shot? In order for to play video shot with Case Air, you need to download the video file to your computer, phone or tablet. This is done the same way as downloading images. You can do it either from the Album view or from the preview screen. Once it is downloaded to your device, you will need to use your device’s video player to play it. Can I connect the Case Airs from 2 cameras to 1 device? Because the device (laptop, tablet or smartphone) can connect to only one wifi hotspot, you can not connect one device to multiple Case Airs. You can manually switch between multiple Case Airs by switching which wifi you are connected to. Going through a router is also not an option since the device has to connect to the Case Air even if the Case Air is connected to a router. What is the optimal connection setup? How do I connect my Android phone or tablet to WiFi while using the Case Air? You will need to connect your Case Air to your router. View the instructions here. How do I connect my iOS iPhone or iPad to WiFi while using the Case Air? How do I connect my Mac computer to WiFi while using the Case Air? How do I connect my Windows computer to WiFi while using the Case Air? Questions submitted here will be added to our FAQ. If you need a direct answer back, please provide your email address in the question and we will reply to you directly.